Besame Cosmetics was created by Buenos Aires native Gabriela Hernandez. She was inspired by the ritual of watching her mother and grandmother put on makeup and the affectionate feeling it left in her. Besame Cosmetics intricately designed packaging is inspired by the European and South American made compacts she would find on her mother’s vanity. 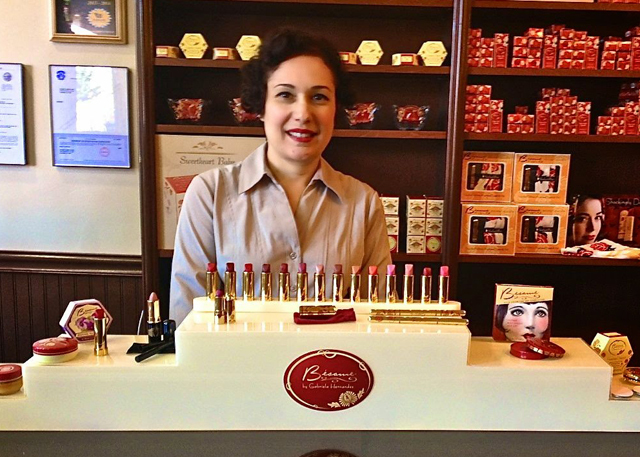 With a love of antiques and timeless glamour Gabriela created Besame Cosmetics in 2004. While she focused on her dream of a cosmetics company Gabriela studied to receive her fine arts degree as she worked as a photographer, artist and graphic designer. To create the old world look of her cosmetics line she would scour estate sales collecting antique makeup and vintage compacts. These unique finds became her reasearch for the development on the Besame look and overall brand. Just like that of her grandmother and mother’s makeup Besame cosmetics invokes feelings of another time period. With inspiration coming from the 20’s, 30’s and 40’s and their consecutive art movements, like art deco. And just like in those less wasteful times each Besame product is created in collectible tins to be admired later, like a memory of your grandmother. Previous articleJoy For the New Year: Take two capsules of happiness twice daily.